The REVIT! Bastion GTX Glove is the ultimate winter glove from both a protective and waterproof breathability standpoint. 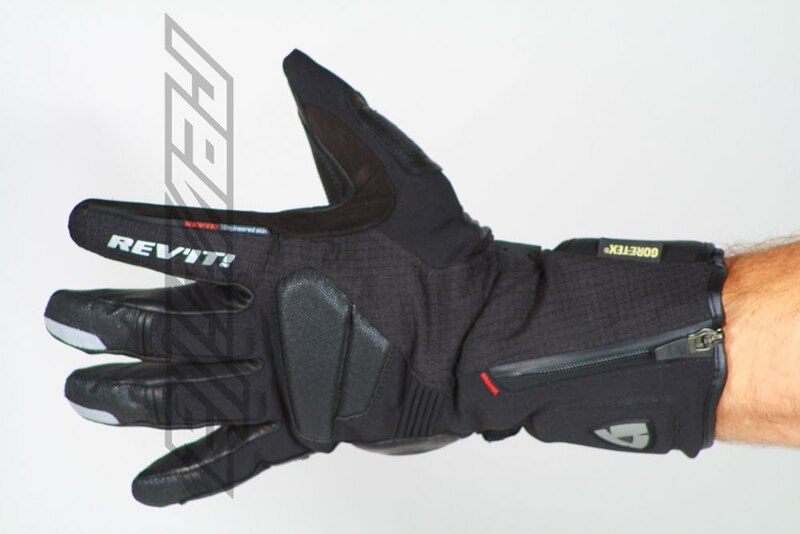 REV'IT used the GORE-TEX membrane for the highest level of breathability and water/weatherproofing and utilized state-of-the-art fabrics and protection elements derived from their MotoGP gloves to create a breakthrough winter glove. We are really excited about the new live of REV'IT! GORE-TEX motorcycle gear. Combining the leader of the pack in ADV touring gear with the most proven and trusted manufacturer of waterproof breathable gear is a home run all day long. The REVIT Bastion GTX glove does not disappoint. The outershell is constructed using teflon-coated 1000D ripstop Cordura, water-repellent goatskin and suede leather, and Schoeller Dynamic which is an extremely durable stretch fabric that breathes well and dries quickly. The Schoeller also utilizes their proprietary Nanosphere material, which is a hydrophobic fabric to which water and dirt can not affix to. This makes it really easy to keep clean and extends the life of the glove. The addition of SuperFabric, tiny laser-welded ceramic plates 14x more abrasion-resistant than Kevlar, adds to the overall protective value of this glove. Of course you've got the GORE-TEX waterproof breathable membrane built into the core of the glove to keep you warm and dry in the cold and wet months, but you've also got a Thermolite Plus push-pull tri-fleece liner. This offers a very comfortable feel against the hand and also provides a great level of warmth. As far as protection, REV'IT! borrowed heavily from their MotoGP gloves for the REVIT Bastion GTX. PU injected finger knuckles and backhand protection with TPU hard-shell little finger protector, a dual-comp honeycomb palm slider with added EVA foam reinforcements at the thumb and wrist. You're going to be safe in this glove. There are also all of the subtle creature comforts that REV'IT never leaves out of the mix. Stretch paneling at the fingers and the back of the hand so the hard parts stay in place and your hand is never uncomfortable, gripping the controls or otherwise. Goat Window grip patches are integrated into the first two fingers and across the palm for superior tactile feel and grip. Elastication at the wrist aids in accurate fit and allows the glove to be worn inside or outside a jacket with a single velcro cuff. Finally, and this may be our favorite feature, is the visor wiper on the index finger of the left hand. This makes it really simple to keep your visor clean when you're on those long adventure rides. Straight up, this is a phenomenal glove that is sure to be a big hit in our winter glove line-up. 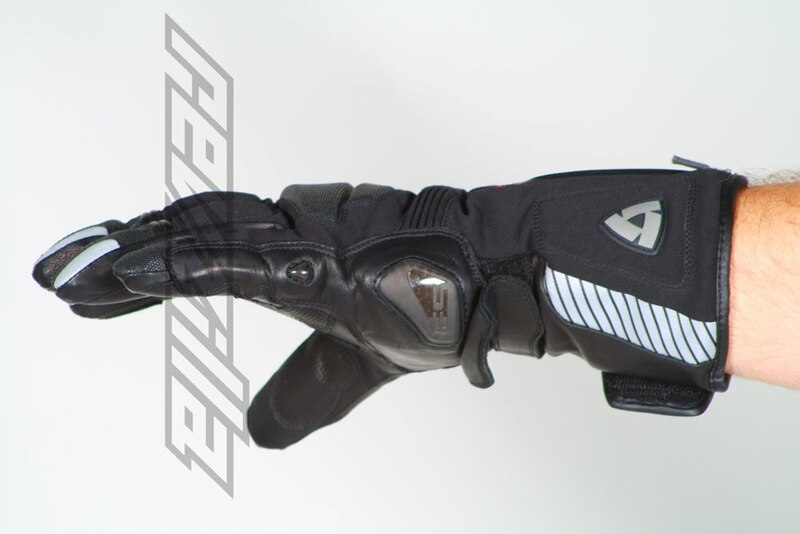 Check out its competition by visiting our winter motorcycle glove section at RevZilla.com. Also, you can see the full hi-res photo gallery of the REV'IT! Bastion GTX by visiting live.revzilla.com.